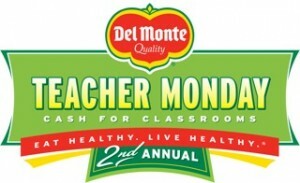 Teacher Monday & Del Monte Giveaway – Over $100 in Prizes! 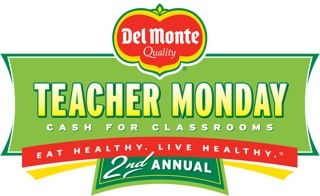 This fall Del Monte Fresh will hold its second annual online contest, “Teacher Monday: Cash for Classrooms.” The program awards cash and fresh fruit to kindergarten thru 12th grade school teachers across North America to encourage them to incorporate healthy eating and living messages into classroom activities. Sixty teachers will win a total of $1,000 in cash to purchase school supplies and fresh fruit for their students. 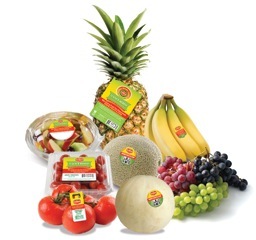 Top winners will also get a Del Monte Fresh Field Day event for their school in which the entire student body will enjoy a day of Del Monte fresh fruit, games and fun activities. Salad bars for schools will also be given away through promotions at supermarkets. 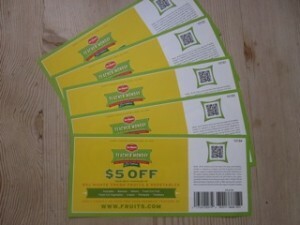 Go to www.fruits.com for more details! 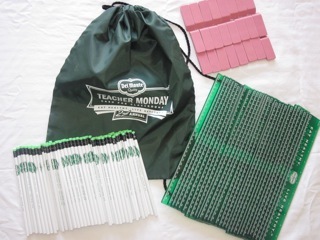 And one reader will win a backpack full of school supplies to give their favorite teacher! This contest is open to all US residents. Entries will be accepted until the end of the day (midnight Central) Wednesday, September 14. Mandatory Entry: Comment below telling me who the most influential teacher in your life or your child’s life has been. My most influential teacher was Mr Paz. He was tough but I learned so much from him. My 5th grade teacher was very influential. She instilled a love of history and archaeology. My most influential teacher was a math teacher in high school. He was also my soccer coach. He really encouraged me to think about my future and college. The most influential teacher in my life was my 7th grade English teacher who challenged us to read beyond our years. My most influential teacher was Sister Jolancia. She was no-nonsense but with a heart of gold once you got past that tough exterior and she taught me some life lessons that I still mentally thank her for today at the ripe old age of 72. Thanks for the giveaway…two outstanding educators in my life were my 1st grade teacher Sister Ann Henry, and a college history professor, Ronald Smith…both wonderful teachers who could grab a class by the lapels and draw you into complete focus of the subject at hand, enthusiasm for learning that was infectious ! My high school principal was the most influental teacher in my life. He told me I could be anything I wanted to be.